What happens when you have metals dissolved in your water? This article will explain more. People should be aware of metals in pool water for a few reasons. Water can dissolve almost anything. There is reason water is called “the universal solvent”. Sure, water can dissolve minerals like calcium, but water can dissolve metals like iron, manganese, copper and silver too. Some of these heavy metals have sanitation benefits, as we will discuss later, and all have long-term consequences. 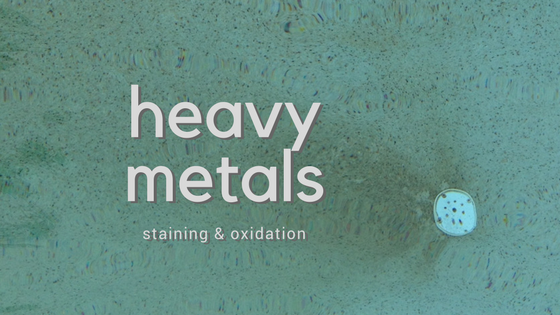 Having heavy metals in solution—particularly in swimming pools—is what this article is about. Heavy metals themselves—like iron, manganese, copper and silver—are virtually invisible when totally dissolved in water. That is, until those metals are oxidized. On the Orenda Blog, we have talked about oxidation before: here, here, here and here. Oxidation is when an atom loses electrons. Oxidation usually occurs in an oxidation-reduction (or “redox”) reaction. All that means is another element like Oxygen or Chlorine (or Hypochlorous Acid, in swimming pools) steals electrons from the atom. until the chlorine overcomes them, building a residual after point A.
Let’s take the easiest example: Iron (Fe). Iron is an easily oxidized metal because it does not hold its electrons with a very strong bond. When something like Oxygen (O2), Water (H2O) or Hypochlorous acid (HOCl) meets it, Iron tends to lose electrons rapidly. In this case, Iron is the reducing agent, because it loses electrons. 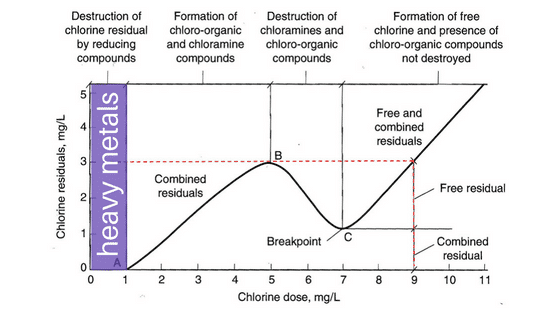 Chlorine is the oxidizing agent, because it gains electrons. We know the byproduct of this reaction as rust. Rust is iron oxide—Fe(OH)2—and depending on factors like pH and salts, it comes in many forms. In fact, there are 16 different forms of iron oxide. All you need to know is this: water, oxygen and the strong form of chlorine in a pool (HOCl) all oxidize iron, creating iron oxide (rust). In the water, that iron oxide can stay suspended in solution, or it can fall out of solution and stain. Naturally, that stain will be rust-colored. If you have rust stains in your pool, it’s probably iron oxide. Copper can both oxidize and be oxidized, in other words. Oxidized metals remain in suspension (and relatively invisible to the human eye) until the water has reached its saturation point. Heavy metals begin to come out of solution and form stains after the saturation point has been exceeded. The color and severity of the stains have to do with the type and concentration of metal involved. We wrote an article about a newly filled swimming pool turning green from copper. It happened because the groundwater in the well had high copper content in it to begin with. On top of that, a copper-based algaecide was poured into the pool as a precaution against algae…but was followed up moments later by liquid chlorine. The chlorine oxidized the copper algaecide and BOOM. Green pool. Had the copper level not been so high, the reaction would not have been as dramatic. We may not have even been able to see it, if it were below the saturation limit for the water. Preventative care is something we at Orenda preach every day. We are fundamental believers in minimalist, meaningful pool care, which includes thinking ahead. We advocate for testing fill water and filtering metals out of the tap water that fills a pool. Also, we encourage plaster crews to filter out metals from the water they use to mix the plaster itself, lest those metals continue to oxidize in the pool’s surface and cause chronic staining problems. To prevent metal stains (rust stains, for example), it’s about keeping metal levels in the water low; at the very most, a controllable level. This is difficult when the tap water has high metal content in it. It’s even more difficult when using metal-based products by choice (the good news is, you can choose to stop using them). Keeping metals below the saturation point of water can be accomplished by filtering out/removing metals with products like MetalTrap® or CuLator®. We have had tremendous success field testing these products. 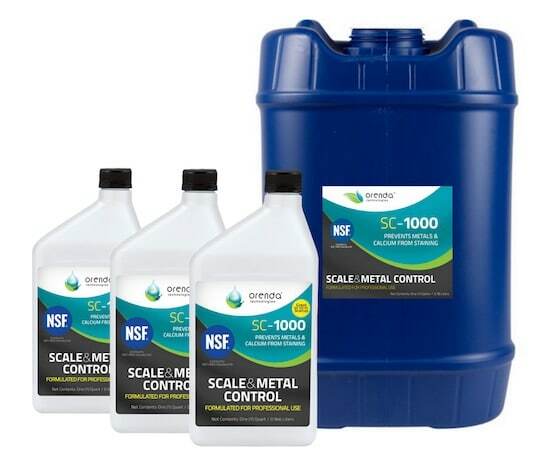 SC-1000 is a chelant designed to keep metals and minerals in solution, and can help prevent staining. Another way to assist in controlling metals to prevent staining is through chelation or sequestration. Most of them are acid-based (usually phosphonic acid, aka phosphates). Ours is non-phosphate based, and also non-acid based. It’s called SC-1000 Scale & Metal Control, and it effectively holds metals and minerals in solution. Don’t take our word for it…we let the product speak for itself. To recap stain prevention: 1) reduce metals in the water through filtration and removal, as low as possible, and 2) control metals through chelation and sequestration with a product like SC-1000. Removing existing stains is a different issue, but similar steps to remedy. The first step is to try and lift the stain from the affected areas. Chelate or sequester it with a product like SC-1000. You can accelerate the stain removal with ascorbic acid. Monitor the pH of the water when doing this step. Pool operators may want to vacuum or brush the stained area too. Remove the metals from the water once the stain has been sufficiently lifted, and the metal has been brought back into solution. Pool stain removal can take minutes or it can take weeks. There are too many variables that impact the process to discuss here. Moving forward from stain removal, follow the steps above for prevention, which should help eliminate the problem long term. Pool stains are a nuisance, but an understanding of why they occur can help you manage them. Oxidation of these metals is inevitable in the presence of a pool sanitizer like chlorine. Rather than try and prevent oxidation from occurring, we say, reduce the amount of metals to begin with. In our opinion, keep metal levels as low as possible. It’s that simple.